Plutocracy is rule by the wealthy, or power provided by wealth. The combination of both plutocracy and oligarchy is called plutarchy... [A]ccording to Kevin Phillips, author and political strategist to U.S. President Richard Nixon, the United States is a plutocracy in which there is a "fusion of money and government." The wealthy minority exerts influence over the political arena via many methods. Most western democracies permit partisan organizations to raise funds for politicians, and political parties frequently accept significant donations from various individuals (either directly or through corporations or advocacy groups)... Many corporations and business interest groups pay lobbyists to maintain constant contact with elected officials, and press them for favorable legislation. Owners of mass media outlets, and the advertisement buyers which financially support them can shape public perception of political issues by controlling the information available to the population and the manner in which it is presented. "I do not believe that we should offer any guarantees of protection in post-hostilities periods to Germans who are working for your organization. I think that carrying out of any such guarantees would be difficult and probably we widely misunderstood both in this country and aboard. We may expect that the number of Germans who are anxious to save their skins and property will rapidly increase. Among them may be some who should properly be tried for war crimes or at least arrested for active participation in Nazi activities. Even with the necessary controls you mention I am not prepared to authorize the giving of guarantees." Nor did he. Right after he died, though, Truman relented a bit-- with strict guidelines... that were stealthily, systematically-- and gleefully-- ignored. But once the GOP retook the White House, and the Dulles Brothers, those pillars of American plutocracy, grabbed the levers of power, the floodgates opened-- and they opened wide. Almost a dozen programs, starting with Project Overcast and then Paperclip, were used to bring tens of thousands of Germans and brutal far right quislings, primarily from Eastern Europe, into the U.S. It was a determined, if semi-secret, wave of right-wing immigration specifically meant by anti-Semites like the Dulles Brothers, to counter the influence of Jews and "leftists" in America. War criminals of every stripe, including mass murderers were resettled in America under the auspices of the Dulles Brothers and, later, Richard Nixon. Did these immigrants make a contribution, as other waves of immigrants have? Well, they certainly made a contribution to Republican Party fortunes in states where they settled-- and being able to continue their work in biological and psychological warfare here brought America Lyme Disease, West Nile Virus, and drug, chemical and radiation tests on unsuspecting Americans... and, a major goal of the international plutocrats-- the Cold War and the rise of plutocracy here in America (see, especially, Wisconsin, Ohio, Florida, Michigan, the House of Representatives, Mitt Romney's presidential campaign...). Yesterday Sam Stein reported on what appear to be an anomaly, a teensy weensy little flip flop by Republican Senate Majority Leader-- and plutocracy fanatic-- Mitch McConnell. 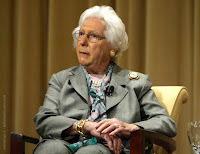 Miss McConnell, like Mitt Romney, was for raising taxes on the rich before he was so hysterically against it that he would rather see the country go down the drain. In a 1990 campaign ad, Miss lisped, "Unlike some folks around here, I think everyone should pay their fair share, including the rich." 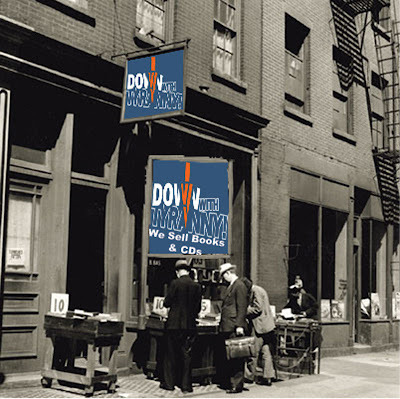 The ad was produced by Roger Ailes, like the Dulles Brothers in their day, a pillar of Plutocracy in ours. The 1990 campaign ad still stands out for what it says about the political mood of the country-- specifically the mood in economically depressed areas that usually vote Republican. McConnell is known for being one of Congress' more astute political minds. The fact that he once espoused tax code fairness in the heat of a tight election shows that even people from Kentucky, at one point, applauded lawmakers for asking the wealthy to further subsidize the social safety net for the middle class and poor. "What has been amazing, watching his career, is it doesn't bother him a bit to say whatever he needs to say to get re-elected. Mitch would just say whatever he needed to say," said Jim Cunningham, a long time Democratic operative who managed the campaign of McConnell's 1990 challenger, Harvey Sloane. In Kentucky, "there was a time when... you could poll people on taxes and they believed that if you needed to raise their taxes, especially to take care of education, you should do it," Cunningham said. "Over the years it seems like folks pay less and less attention. At the same time that the Republican Party in our state has helped them buy into this notion that we don't need to tax the rich because they are the ones who create the jobs." This week Jeff Merkley (D-OR) and 22 other senators called on Miss McConnell to put job creation first, rather than the deranged rush towards Austerity that is ripping apart the social fabric of England, Greece and a dozen other countries right now. “For families across the country, the biggest economic problem is high unemployment,” wrote the senators. “As you know, the lack of jobs and anemic growth rate of the economy are not only enormous problems in their own right, causing great pain for millions of Americans, they are a major component of our deficit. Indeed, the loss of revenue resulting from the recession accounts for nearly $4 trillion of the projected deficits over the next 10 years. “It is therefore appropriate and important that the JSC explicitly embrace job creation as a part of its mission,” they continued. “Targeted investments in economic growth and job creation can complement and even enhance long-term deficit reduction efforts and should be a priority that the JSC embraces. Americans are deeply confused about why the economy is so bad-- and their President isn’t telling them. In fact, the White House apparently has decided to join with Republicans and blame it on the long-term budget deficit. Before I turn to the President, though, let’s be clear: The lousy economy is due to insufficient demand. Consumers-- who are 70 percent of the economy-- can’t and won’t buy because they’re running out of cash. They can’t borrow against homes that are worth a third less than they were five years ago, and most consumers are bad credit risks anyway because they’re losing their jobs and their wages are dropping. They also have to start saving for the kids’ college or for retirement, which will cut their spending even more. Which means government has to step in to boost the economy-- as it has every time the economy has fallen into recession over the last eight downturns. Include the massive spending on World War II that lifted us out of the Great Recession, and it’s nine. The Fed can help, but it can’t do it alone. And it’s least helpful after a huge asset bubble has burst because the financial system won’t channel low interest rates where they’re most needed-- to small businesses and average consumers. This time we tried one stimulus that was way too small relative to the size of the falloff in demand that started in 2008-- especially given that states and locales cut their spending by almost as much as the federal government increased it. So we need another-- a bold jobs plan. So rather than fight for a bold jobs plan, the White House has apparently decided it’s politically wiser to continue fighting about the deficit. The idea is to keep the public focused on the deficit drama-- to convince them their current economic woes have something to do with it, decry Washington’s paralysis over fixing it, and then claim victory over whatever outcome emerges from the process recently negotiated to fix it. They hope all this will distract the public’s attention from the President’s failure to do anything about continuing high unemployment and economic anemia. Excellent article! Howie really nails it here. FTA - "Plutocracy is rule by the wealthy, or power provided by wealth. 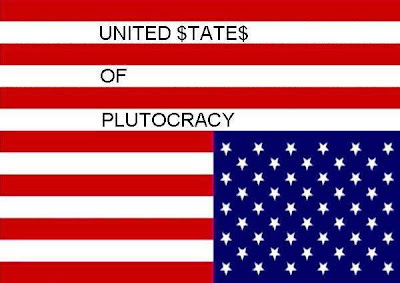 The combination of both plutocracy and oligarchy is called plutarchy... [A]ccording to Kevin Phillips, author and political strategist to U.S. President Richard Nixon, the United States is a plutocracy in which there is a "fusion of money and government." This is precisely the problem that we have in America today. Our political system has been hijacked by the plutarchy, and victories for the people are rare. The Supreme and Federal courts have been packed with right wing corporatist judges, campaign finance laws sell out elections to the highest bidder, and the corporate MSM doesn't do it's job in asking the tough questions. I'm still hoping that evolution can happen instead of revolution, but it's going to take some bold moves quickly to prevent it. The Great Recession ended for the rich and powerful in the summer of 2009, but the rest of us are still embroiled in and we're pissed off about it. Change is inevitable, it's just a question of whether it is managed or whether an American Spring erupts. You're absolutely correct in that we are being ruled by the wealthy in this country. The rich are getting richer and the poor are getting poorer. It's a very sad but true fact. Great post. Your article, as usual, helps me see the political realities beneath the multiple layers of kabuki. We may as well be 18th century England for all the good our supposed democracy is doing to impact our nation's well-being for the better. The situation you describe will clearly deteriorate if our only, currently-organized, possible obstacle to total neo-feudalism, (i.e. the Democratic party) can only get 22 of 51 of it's senators to sign Merkley's letter. I really can't think of much good that came out of Truman's presidency, but I can think of a few big, BAD things. Why in the world did FDR ditch Henry Wallace for Truman? I can only think that he had become weaker with age, suffering and no longer up to his previous strength. John, thanks for your recommendation for an online bookstore. I'll check them out. I've been looking for an alternative to Amazon, which (like Google) is becoming more and more like your typical greedy republican corporation. Talk, talk, talk, talk..Nothing new about that.. Point the finger point the finger.. Nothing new about that either.. The true point is that in order to change whats going on it will either take alot of money.. Fight fire with fire Right? Or the people will have to be pushed into violence..
Could Anti-Austerity Fever Spread To America?